Discussion in 'Videocards - AMD Radeon Catalyst Drivers Section' started by Watcher, Jan 13, 2013. 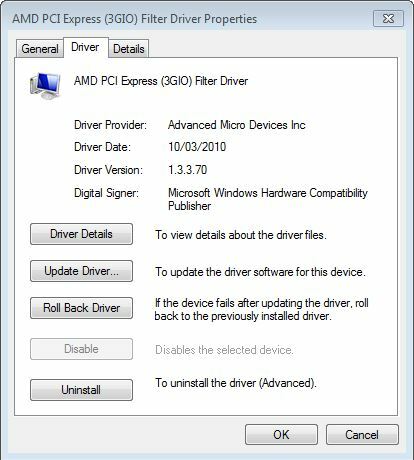 AMD PCI Express (3GIO) Filter and PCI Bus Driver requires manual updating. I've come across some information that all AMD GPU owners on AMD Chipset boards should know. The PCI Express driver seems to be missed and not updated during catalyst driver installation. I've noticed this issue on a number of computers and seems to be an issue with Windows not allowing this update of this particular driver. You can verify the version of the PCI Express driver by following the direction below. The " (3GIO) Filter " is from older Catalyst drivers while the " PCI Bus " entry is from the newer Catalyst drivers. If your GPU is using the latest version of Catalyst driver, you should never have the " (3GIO) Filter " entry. The following procedure will allow you to update the " PCI Bus " to the latest driver version. When you install your catalyst driver, the installer copies the files it uses to the directory " C:\AMD\Support " followed by the version of Catalyst driver you are using. For example on my computer the whole path is " C:\AMD\Support\12-10_vista_win7_win8_64_dd_ccc_whql_net4 "
The last folder listed " 12-10_vista_win7_win8_64_dd_ccc_whql_net4 " will change depending on the version of Catalyst driver you are using. Now navigate to the " C:\AMD\Support\12-10_vista_win7_win8_64_dd_ccc_whql_net4\Packages\Drivers\amdkmpfd "
Now double click your entry in your device manager. You'll find " PCI Bus " listed under the main heading of " System Devices " and change to the driver tab. Click on update driver and browse to the folder that holds the files for your operating system. Allow Windows to update the driver and you will need to reboot your computer. Once computer restarts, your will have the latest driver version installed for the PCI Express bus. As always, make a system restore point before you perform any driver updating. I'm curious on how wide spread this issue is and will be monitoring this thread for responses. Just gave this a look on a Windows 8 x64 install. I was using the "PCI Bus" driver provided from Microsoft, and it was never updated with installation of 12.10 Chipset drivers. Manually updating it resulted in my system locking up for about a minute (literally, no activity at all), then my display went out and came back on, and I was prompted to reboot. Do you play any games? Try gaming and see how the computer performs with the driver you just installed. If you have any issues, you can always roll back the driver to the earlier version. Amd driver was not installed. Just followed your guidelines and did a restart. Gonna play some games and see how things go. I dont see any difference compaired to the 2006 win7 x64 pci bus driver i had installed. think this is a placebo effect. Surely something is better, then again if it was important you would have thought by now AMD/ATI or Microsoft would have reported to upgrade it. Played Far Cry 3 for an hour or so and didn't really notice a difference. What exactly is this supposed to do? Best practice is to have the latest driver installed for all your hardware to allow for better performance and bug fixes. No different then updating your catalyst driver, audio driver, network card driver and so on. Got my PCI Bus driver updated - thanks for the info. How about the AMD IO Driver and ATI I/O Communications Processor PCI Bus Controller? The items you have listed are the up to date drivers for those devices. If the driver exists, it has to exist for some reason (would of really liked to see a changelog or something from AMD though to see what was changed/fixed specifically). Although I didn't really notice any performance difference either. can anyone find out what are the changelog ? because if it doesn't change anything, why did they make a new version of it, i have installed the new version, but nothing feels different. when i updated mine, my system didn't lock itself, and my display didn't went blank, its weird why yours did that. Mine did that as well. Hey thanks man running on Win8 64 mine said it's from 2006. Updated and everything's okay but no difference, oh well. There seems to be some confusion about there being a separate change log for this driver. This is part and parcel of the catalyst driver package. This driver allows your AMD Chipset to function correctly between your OS and your installed GPU hardware. You can think of this driver as part of the overall change log that comes out with every catalyst driver update. You may not see any difference in game play but you don't know what is going on behind the scenes as far as OS to GPU operation and you don't know if there would be a situation were this driver would actually allow better performance. Would you really want to take the chance on not having a driver that's not up to date when it's sole responsibility is the communication between the OS and the GPU hardware? I think not! If you are using the latest version of the Catalyst driver, you should perform the update as described on my first post. If you are using an older version of the Catalyst driver, you may want to leave it. Remember, you could always try the newer driver and if you experience any issues, you can always perform a driver roll back or a system restore to resolve any issues the newer driver may have caused. If you would like to try the newer driver without installing the whole Catalyst driver, use the following steps. 1) Download the latest Catalyst driver. 2) Start the installer as you would if your are installing this version. 3) When the install windows appears and asked if you would like to do a custom or express install, just exit out of the installer. Your present Catalyst driver will be unaffected by this procedure. 4) The driver package will be present in the folders listed on my first post and you will be able to follow the driver update instructions from there.